Sometimes the things that need to be questioned the most, are the things we feel we’re least able to question. 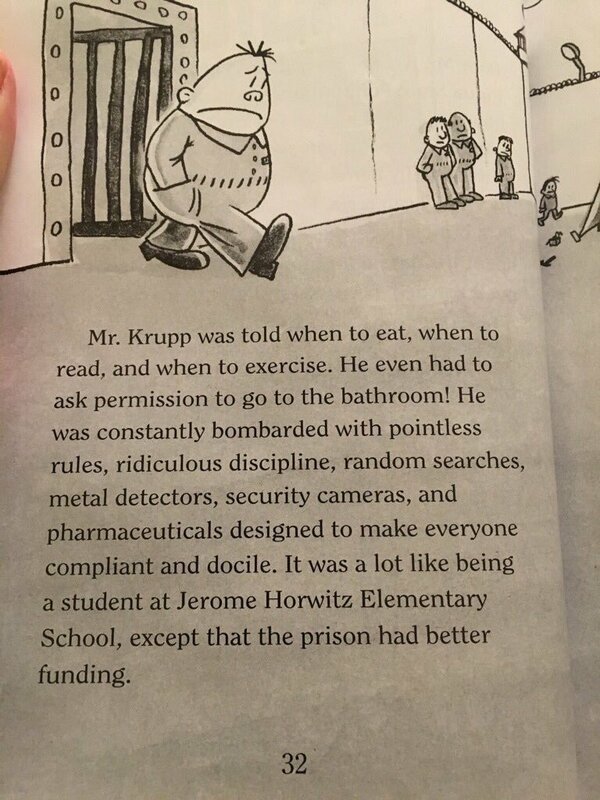 The parts of the education system that carry the guise of being ingrained, natural, and untouchable. Things that have “always been” and things that will “always be”. 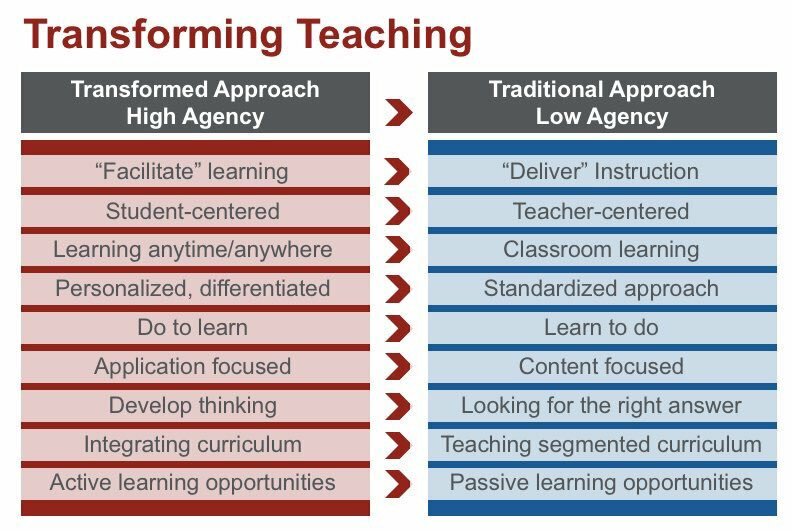 But if we really want to pursue more agency for students and shift the current paradigm of education, then maybe these are the very things that we should be critically questioning, challenging and re-imagining. Sometimes this is difficult to do because these human-created systems have seemed to almost calcify overtime to the point where it’s hard to figure out how to remove them, or change them. … with the intent of creating a place that respects and supports each student’s agency as a learner and a human being and supports the processes of learning as they naturally occur… would those elements and structures be part of the design? I’m not saying that they’re all bad (or that any of them are bad) I’m just saying that making an informed choice as an education community about the structures and systems we choose to have to support learners and the process of learning, is very different than passively accepting elements of the educational paradigm that have been passed down, or passed off as “untouchable”. Which “untouchable” elements of the current education paradigm do YOU think need to be critically questioned? Friedman suggests in his article that the rebellious act by Facebook, defined by Merriam Webster as opposing or taking arms against an institution, failed because Facebook failed to take into account the ethical conduct necessary to respect its users. That word, rebellious, is a contentious one. It could be interpreted in so many varied ways. Friedman’s mentor, Dov Seidman, suggests that “The world is fused. So there is no place to stand to the side and claim neutrality—to say, I am just a businessperson’ or “I am just running a platform” (in Friedman, March 2018). If we are ‘just’ rebels in education, there might be some ways that our function is misunderstood. ‘Just’ being a rebel means being oppositional. ‘Just’ being a rebel might be misconstrued as creating disturbances in a system for the sake of technicality. A rebel alliance in education that self-organised after IBSG2018 defines our identity as a group which “shares in a dream of a better approach to education and are willing to fail, be a little a different… and even get in trouble if we have to” (Educator Voices, About). A hunch is that it’s not actually ‘just’ being oppositional that we celebrate and embody, but rather we embrace the agency of being thoughtful, interdependent critical thinkers who ask what Adaptive SchoolsSM ask themselves. Who are we, why are we doing this, why are we doing this, this way? (Garmston and Wellman, 2013, p. 10-11). If we narrow our definition of what ‘rebels’ pose as mere disturbances to the system, we fall into the trap of dichotomous thinking: that we are either oppositional or we are obedient to the status quo. The complexity of change and change leadership in our schools asks us to widen our consciousness beyond the limits of dichotomy. The complexity of culture in schools creates difficult questions. Nadia Ellis asked some questions listed below and many more in her blog post. These questions provoke thinking around adaptive problems in schools and in education. In navigating change, we question our identities as educators. Why do many think of changing “education”, but no one thinks first about changing their “teaching”? We question why we are doing this. Why don’t we constantly re-examine beliefs about learning and teaching to consider how schools can best serve learners? And we question why we do this, this way. Why don’t we have open discussions about what we want learners to know and do? When we ask these questions, we are perhaps clarifying identity as we change form (Garmston and Wellman, 2013, p. 10), which is what adaptive organisms (and organisations) do in times of change. Education is changing in response to a changing world. Educators find themselves in the ecotone, that area of tension that arises from disturbances as we make the transition between what was and what we want to become (Zoller, March 2018). One of the challenges for the educator might be because we don’t necessarily choose the state of facing change. Ecotones present themselves when we are thrust into one; as something in a system that already exists; or when we create one (Zoller, March 2018). You might be in an ecotone illustration by Aloha Lavina based on Kendall Zoller’s work. When we face this journey of transformation, we may feel torn, pulled in different directions, frustrated at times because, how do we find a stable place to stand on when the place we stand on is the one shifting? The pressure to figure it out is relentless in the VUCA world. We may have internalised the sense of urgency to act. This is a time of turmoil for the self because “identity is both the director and the work in progress” (Zoller, March 2018). Teachers are also individuals, and just as we have a personal value system as a person, our professional persona also has its own value system. Seidman, talking about Facebook’s fail, suggests that what the world needs from the social media platform is for it to find a different kind of leadership because ““sustainable values are what anchor us in a storm, and because values propel and guide us when our lives are profoundly disrupted.” (in Friedman, March 2018). What happens when values clash with values? If someone sees himself at the cutting edge of current learning trends because a unit uses design thinking, yet uses a problem that was planned 30 years ago for a homogenous classroom and now applied in the current classroom of diverse, cross-cultural kids in an age when robots can laser-print an entire building — what might be the assumptions at work? Is this practice innovative? Should students duplicate what machines can do, and what does that mean for our future? As we ponder the changes in education and in our schools, perhaps the greatest ecotone we must cross is the journey from our own old mental models to the identity we need to serve our students today. What if our most frightening area of tension was our shifting identity as educator? Illustration by Aloha Lavina based on Immunity to Change (Kegan and Lahey, 2009). Conflicts arise when our beliefs clash with…our beliefs. Kegan and Lahey (2009) give us the concept of immunity to change, suggesting some reasons why people (and organizations) do not change despite good intentions. The authors’ idea is that our own mental models often get in the way of enactment for change. The concept of immunity to change is not a suggestion for us to plunge into deep despondence that we are storms of contradictions. The suggestion is that we might examine how we see and make meaning of experiences, and in the process of reflection, create a greater consciousness for who we are, why we’re doing this, and why we’re doing this, this way. Intentionality in our work toward change in education nudges us toward a more thoughtful agency. Might we slow down and lend ourselves thinking time, pausing in what Stephen Covey calls the ‘arena of consciousness’ so we can examine what assumptions we hold regarding teaching and learning? There are conflicts that arise again and again in schools, and we think they are problems, which we can reduce to either-or thinking. 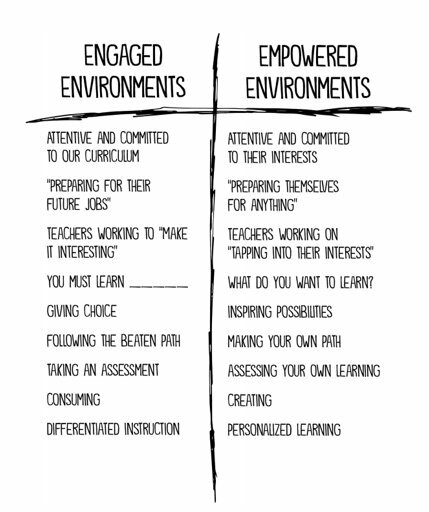 Rigor and inclusion. Agency and accountability. Standards-based curriculum and inquiry. These tensions emerge often in our schools because they are not problems to be solved with an algorithm or patterned solution. They are polarities, tensions which loop in infinite motion between one and the other (Johnson, 2014). They are not solved; they are managed (the idea of polarities are from Polarity Partnerships). In our distress we may not notice that both polarities are necessary and co-exist. Rigor to the neglect of inclusion alienates students who learn differently. Inclusion to the neglect of rigor does not guarantee competencies and other important outcomes of an educational experience. Both polarities are necessary and they co-exist. Holding both in your thinking requires a discipline to avoid falling into dichotomous divisions, which may pressure the teacher into thinking he or she must choose between one or the other. Just as Facebook must now see itself as both community space and responsible cultural agent, we too need to integrate our identities as change agents and responsible rebels. Students are waiting for our professional response. Garmston, R. J., & Wellman, B. M. (2013). The adaptive school: A sourcebook for developing collaborative groups. Norwood, MA: Christopher-Gordon. Johnson, B. (2014). Polarity management: Identifying and managing unsolvable problems. Amherst, MA: HRD Press. Kegan, R., & Lahey, L. (2009). Immunity to Change: How to Overcome It and Unlock the Potential in Yourself and Your Organization. Cambridge, MA: Harvard University. Zoller, K. (2018, March 9). Leading in the ecotone. Speech presented at Thinking Collaborative at NIST, Bangkok. It was very clear at the 2018 IB Global Conference and IB World Heads Conference that there are a number of educators out there who are pushing the boundaries, shaking up the system and challenging the status quo. All in pursuit of respecting and supporting agency and a better, more humane approach to education. We have different roles – teachers, leaders, coordinators, librarians, counsellors, administrators, heads of school, IBO staff members. We’re at different stages of our journey – first steps away from being a robot all the way to being full fledged rebel-leaders. So we invite you to follow our blog, read our posts, leave us comments and join the conversation.